Conveniently located only 3 miles from the business and financial center of Central Florida, Orlando Executive Airport (OEA), operated by the Greater Orlando Aviation Authority (GOAA), is the perfect flight path for the corporate traveler. Convenient access to all of Orlando's major highways puts the majority of industrial and business centers within minutes of the airport. Central location and a long list of amenities also make Orlando Executive Airport the ideal spot to touch down en route to any of the area's convention centers, major attractions, theme parks and beaches. In addition, "door-to-door" service makes the transition from air to ground transportation easy and effortless. Orlando Executive Airport provides 24 hour service through our two fixed base operators, Sheltair Aviation Services (SAS) and Atlantic Aviation, an FAA air traffic control tower, a Customs and Border Protection (CBP) customs facility, and full ILS capability. Orlando Executive's central location means that delegates will find numerous restaurants, hotels, stores and theaters within a 3 mile drive of the airport, as well as one of the most popular shopping malls in Orlando. For more than 25 years, Angel Flight Southeast’s mission has been to arrange free flights so children and adults can have access to the far-from-home doctors that can save their lives. The Run for the Angels 5K was held at Orlando Executive Airport on March 31, 2018. Last year almost 400 participants raised more than $30,000 for Angel Flight Southeast, and we hope that you join us for the 9th Annual 5K on April 20, 2019. Sign-up today. 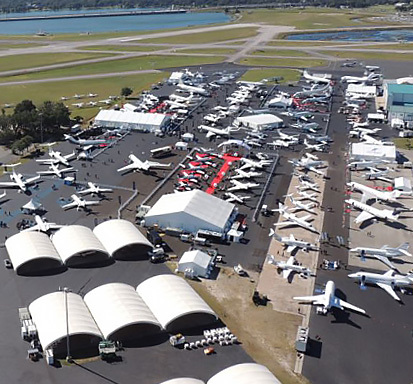 The National Business Aviation Association (NBAA) Static Display will be held in Orlando on October 6-8, 2020. The static display is at Orlando Executive Airport, and the NBAA Convention is held at the Orange County Convention Center, just 15 miles away. 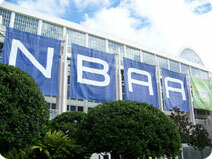 The annual NBAA event was hosted in Orlando in 1996, 2002, 2003, 2005, 2006, 2008, 2009, 2012, 2014, 2016 and 2018. As a vital component of the area's economy, Orlando Executive Airport offers many services to the community - including law enforcement, air ambulance, search/rescue capabilities, and the main reliever airport for Orlando International Airport (MCO). A central location, quality approaches and the ability to handle quick take-off demands make Orlando Executive ideally suited for these operations. In 2018 Orlando Executive's aircraft operations totalled more than 104,000. Central Florida's first commercial airfield, Orlando Executive Airport was first dedicated as the Orlando Municipal Airport in 1928. Since that time, it has continually responded to the needs of a growing community - expanding services, updating facilities and modernizing equipment. Today, Orlando Executive is recognized as the area's finest general aviation facility - and among the best of its kind in the state and the nation. Situated on 1,056 acres owned by the City of Orlando, the airport is operated by GOAA with valuable input from the OEA Advisory Committee which continuously reviews the safe operation and facilities provided to the aviation community. This partnership adds value to the standing of OEA as a premier general aviation airport serving the entire Central Florida region. Both private and corporate aircraft facilities are available, providing business and pleasure travelers with a host of top-flight services and amenities for both based and itinerant aircraft customers. The Airport that brought Commercial Aviation to Central Florida is still its finest General Aviation Facility. Two paved runways: 6,004 ft. and 4,625 ft.
Official opening as "Orlando Municipal Airport". Pan Am begins service to Cuba and Puerto Rico from ORL. Amelia Earhart visits Florida Air Tours, an annual week-long event. Eddie Rickenbacker (President of Eastern Airlines) makes an appearance at ORL's 10th anniversary celebration. 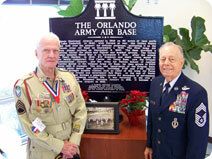 Renamed "Orlando Air Base" as US Army Corps assumes control for military training. Control reverts to the City of Orlando. Commercial air service (Delta, Eastern and National Airlines) commences. Commercial air service starts relocation to McCoy AFB property (the future Orlando International Airport), 8 miles south of ORL. Airlines complete relocation to McCoy AFB, making ORL primarily a general and corporate aviation airport. Operational control of ORL transfers from the city of Orlando to the Greater Orlando Aviation Authority (GOAA). 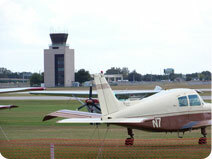 Orlando Executive Airport hosted the static display for the National Business Aviation Association convention. Terminal is razed and construction of new FBO facilities begins. Showalter Flying Service's new terminal opened. 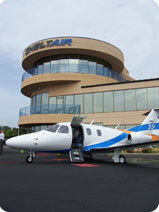 Sheltair Aviation Services’ new terminal opened. 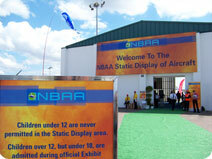 Orlando hosted the static display for the National Business Aviation Association convention. Dedicated a State Historical Marker recognizing the contributions that the airport made in support of World War II. 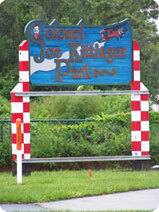 The marker is located at the northeast corner of the intersection of Maguire Blvd. and Livingston St. on the west side of the airport. Orlando hosts the static display for the National Business Aviation Association convention.